Ron Tremblay, spasaqsit possesom, which means morningstar burning is a citizen of Wolastoq Nation. The youngest of 10, Ron grew-up surrounded by the Wolastoqey language and credits his mother and grandparents for his genuine love of the language and with providing him with the true teachings of life. Later in life, Elders he befriended in Frederickston, New Brunswick, guided him deeper into his Wolastoqey traditional ways and through ceremony ultimately into the wisdom and knowledge of the “Wolastoqey way of life”. Today, Ron practises the traditional ways of his people. In November of 2016, Ron was installed as Traditional Wolastoq Grand Chief. The mandate of the Wolastoq Grand Council is to protect and preserve their non-ceded traditional homeland and waterways. 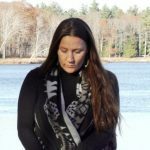 Sherri Mitchell, Weh'na Ha'mu Kwasset, is an author, teacher, activist and a member of the Penobscot Nation. Sherri serves as an indigenous rights attorney and the executive director of the Land Peace Foundation, an organization dedicated to the protection of indigenous land and water rights and the Indigenous way of life. Sherri has been actively involved with Indigenous rights in the U.S., Canada and abroad for more than 25 years. Over this time, her work as been recognized with several Human Rights and Humanitarian Awards. Since 2017, Sherri has been the lead organizer behind "Healing the Wounds of Turtle Island," a 21-year global healing ceremony that rises out of the Wabanaki Prophecy of the Reopening of the Eastern Gate. Sherri is also the author of Sacred Instructions; Indigenous Wisdom for Living Spirit-Based Change, which has received international acclaim. Karen is the co-founder of Transition 5 Villages (T5V), the Upper Valley Apple Corps and the Upper Valley Transformational Action Affinity Group (UVTAAG), local groups working to build a resilient culture by way of supporting regenerative food systems, re-skilling, planting fruit and nut trees for free and public picking and leading actions that are transformational in conception and implementation. Thomas Tonatiuh Lopez Jr. is a graduate of Metro State University of Denver with a bachelors degree in Technical Communications and Native American Studies. Born and raised in Denver, Colorado Thomas identifies as Mexica Otomi, Diné, Apache and Hunka-Lakota. He is a Grandson of Chief Leonard Crowdog and the Son of Water Woman Sharon Dominguez & Sundance Chief Thomas Lopez Sr. 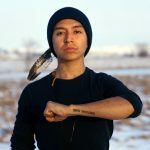 He spent months working with the International Indigenous Youth Council (IIYC) on the ground at Standing Rock to stop construction of the Dakota Access Pipeline. Thomas continues his work in the Indigenous and LGBTQ+ communities to inspire young leaders and create sustainable change. Thomas continues his work with the IIYC as an active board member and adult mentor in Denver, Colorado. 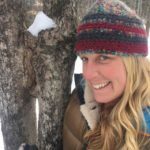 Emma Schoenberg is a Vermont-born community organizer and trainer. 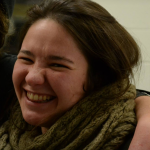 Emma has an enduring commitment to inclusive, equitable, and relational movements in rural communities that began during Occupy in 2011 and 2012. Emma has organized both in transformational movement spaces and in the Vermont Statehouse for policy change. Most recently, Emma was the Lead Organizer at Rights & Democracy and is now a member of the Climate Disobedience Center - a collective that seeks to ground climate activists in the praxis of building relationships among other things. In her years of activism and organizing, her work has touched on consensus decision making, direct action and civil disobedience, popular education, and large-group facilitation as well as political campaigns and policy. Transformational Activism is activism sourced from a place of love rather than hate, which builds bridges rather than divides by maintaining solidarity with the target audience and which maintains a focus on the impact on the level of consciousness that it impacts. In so doing, Transformational Action sustains the activist, opens the door towards behavior change, and heals divides which hamper progress in U.S society. Common characteristics of Transformational Activism are a tendency to keep prayer and ceremony at the forefront, a focus on collective leadership and an emphasis on nourishing and rejuvenating social interactions of all kinds. In this Workshop, Chief tremblay will discuss the philosophy and approach of the First Nations Peoples in protecting their indigenous lands in Canada, focusing on the challenges and victories that they have encountered along the way. In this presentation, Chief Tremblay will highlight the movement to reclaim the original name of the Wolistoq River, from St. John the Baptiste, to reassert the indigenous people’s relationship with that place. 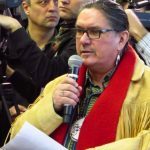 Through his role as the Wolastoqwe Grand Council Chief, Ron has emerged as a leading voice in the First Nations-Led efforts for environmental justice in Canada and beyond. Can we create transformational change using latent conquest ideology to move our activism? When colonial and patriarchal structures of thought are present in our approach to problem solving, we can unwittingly reinforce the oppressive structures that we hope to undermine. In this workshop, you can learn how to recognize colonial bias and engrained patriarchal ideology in your actions and learn how to align your actions with your intended outcomes, while making them more effective and sustainable. Sherri, a leading thinker and writer about the deeper dimensions of personal and social transformation, has given workshops to help activists transform the way they do change throughout the US and beyond. 3. How it can be used as a tool for activism. We will explore our own inner landscape and locate both the triggers and tools of transformation and identify some tangible means of applying such tools to our role as timely midwives helping to usher in a new paradigm that isn’t based on “othering” or “power over” , but interconnectedness. Additionally, we will explore the principles of permaculture as a way of contextualizing and guiding our actions in such a time of uncertainty. This workshop will explore young POC involvement in movements throughout modern history. From Wounded Knee and the Black Panthers to Black Lives Matter and Standing Rock we’ll focus on the importance of youth roles in past and future battles for environmental and social justice. Consensus is not a dogma! Consensus is not a dogma but a consistent and practice that we can bring into any situation that requires decision making. We will go over the formal processes of decision making and discuss how to engender true consensus within communities. This will be a discussion and participation heavy workshop that will cover the tenants of consensus building while working to subvert traditional concepts of group communication. Additionally, we will cover how to handle tough situations within groups and when it is appropriate to move away from the consensus model while still making sure that people are heard.